One of the most fun things to shop for while pregnant (at least for me!) is all of those adorable little outfits you will soon be dressing your little one in. If you're anything like me, every so often, you glance into the baby's closet to admire all of the blue, pink, or in my case, yellow and green. And of course these outfits will be even cuter when they are adorning your pride and joy! 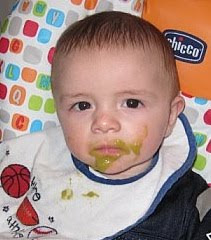 However, there will soon be some unwelcome additions to the clothes - spots of poop and trickles of spit-up in the beginning, and later on glops of sweet potatoes, peas, and carrots! There will probably be some other "God-knows-what" on there too. Now, unless you are planning to do 10 loads of laundry a day, many of these substances and fluids will sit on your baby's clothes for a day or two - and they will stain. That's where the magic that is OxiClean comes in. Just spray it on the spots, and you can get to the laundry when you get to it. I found that the OxiClean even got out stains on things that had already been through the washer and dryer. So, next time you're out shopping for those adorable dresses, handsome overalls, or too-cute bibs, throw a bottle of OxiClean in the cart too! It'll ensure that your baby can wear those clothes over and over.